The CBZ Xtreme has been re-launched in India as Hero Xtreme from Hero Motocorp with a few additional changes in the form of a more stylish and appealing alloy wheels, Digital plus analogue instrument cluster, LED tail lamp, exhaust heat shield, graphics and many more. It is available in two rich variants along with choice of disc brake. A few other highlights include ignition key shutter, anti-drag fuel tank, Rear disc brake, rear shock absorbers and five color variants. A few of the comfort and safety specifications include excellent braking and suspension, 240mm disc brakes fitted in front and 220mm in rear, telescopic hydraulic type and Rectangular swing arm with 5 step adjustable gas reservoir suspension for a safe drive, self-start, alloy wheels, digital plus analogue instrument cluster along with wide seats, under seat storage space, front leg guard and soft handle bar for secure ride. The Hero Xtreme is powered by an air cooled, 4 – stroke single cylinder OHC engine that offers 10.6 KW (14.4 Ps) @ 8500 rpm power and torque of 12.80 N m @ 6500 rpm on ride. The engine displacement offered is 149.2cc. The 5 Speed constant mesh gears offer a comfortable and powerful performance. Hero Xtreme engine will offer 60kmpl in mileage in highway and 50kmpl in city ride. 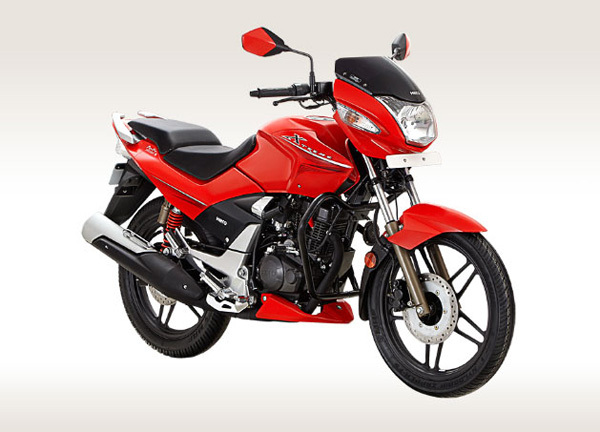 The expected price of Hero Xtreme in the Ex-Showroom of Delhi for Hero Xtreme standard will be Rs. 70,300 and Hero Xtreme FD will be Rs. 67,300. Though, there has been no confirmed report, we are expecting an earlier launch of Hero Xtreme this year. Hero Xtreme is likely been inspired from Honda CBR150R/CBR250R. In this new version, the engine belly will no longer bother you and you can also enjoy rubber-less foot pegs. The blue backlit console will be treating to the eyes. With the electronic immobilizer there will be no need for duplicate keys. The side stand switch with automatic ignition cut-off will be an added advantage. Everything about this bike seems as though has been carefully designed by the manufacturers for comfortable ride. We will however have to wait till its launch for the final verdict.